This cheeky chap was seen around mid-day in the car parking area next to my block of flats and adjacent to the railway line. I just hope that he's not in need of a siesta after a large lunchtime snack of onions. (I pulled mine up yesterday and left them drying on racks in the garden.) Although he's probably been chasing pigeons or rabbits. Best check, anyway. This spider, I think, is an Orb-Weaver and very common in the UK garden. The web is spun in the morning; any insects caught in it are either eaten straightaway or devoured when the web is eaten at suppertime. The next day the process starts again - sort of Groundhog Day, spider style. Well that's this year's holiday jaunt over (and the reason it's been oddly silent here). I've been to the seaside for a lovely peaceful week which was a world away from the riots both in nearby Camden and Croydon, the route I unwittingly chose on my way there. It's a week I look forward to as 4 generations of my family gather together without putting undue strain on any one household but, as I invest more of my time in the veg garden, I can't pretend that it's not a wrench to leave the garden behind, even for a short time. The picking of produce was another matter entirely. It seems that my time in the garden has earmarked the space as being my own and (most) people are loathe to help themselves for fear of being seen to overstep the mark. (On reflection, this is probably good.) Despite cutting several courgettes before I left, and telling folks to help themselves, most were still there when I returned, as were a few handfuls of raspberries still hanging on the canes and other veg untouched. After a (blustery but dry) week away, my first thoughts after unpacking were to pop down to the garden where I found plenty of weeds, beans covered in purple flowers (hurrah! ), radishes ready to eat (3 weeks after sowing), beetroot needing lifting (some about to bolt which I'll leave for seed), recently sown peas clambering half way up the netting - and a 20 inch courgette which made a nice 'baked and stuffed marrow' supper! The sweet peas, sadly, have all but died off with just a few Cupani left. As the weather has been chill and overcast in the last week, this somehow seems symbolic of the slow gentle slide down into autumn - although surely mid-August is too early for this? And where did I go for my fresh sea air? To Littlehampton, a small harbour town in West Sussex, located between Chichester and Brighton and now plying a fine, but not overwhelming, tourist trade. It's an old fashioned town where, I've since discovered, the tiny cinema is in an old windmill on the seafront. More obviously, the harbour is full of brightly coloured fishing boats and ice cream shops, fresh fish is sold on Rope Walk (the quayside) and you can sit overlooking the Blue Flag beach on the longest bench in the world. This seating continues along the seafront and was installed over the last couple of years at an eye-watering £1 million. A week goes so quickly so I missed seeing the Art Deco shelters in the award winning municipal gardens, but I did manage a hike along the seafront towards Rustington where the now-pebbly beach was studded with marine vegetation. What could better? At this time of year, as the tempo of the garden increases, it can feel a bit overwhelming to deal with the sheer volume of produce that is hurled at us after months of hard work. A glut of produce can turn to repetition in the kitchen and boredom at the supper table. I was heading in that direction myself with my courgettes - in pasta, or meat sauces, stir fried, roasted, sliced, chopped, grated. Hoping for culinary inspiration, I nipped over to visit my friend who runs our local deli. Actually, it was his quest for courgette flowers last summer which had motivated me to plant them in the veg patch in the first place. He took a dozen flowers from me. A few were returned the following day, stuffed (with ricotta, parmesan, chives and pancetta), ready to be battered and fried but I had to do this myself. The recipe given to me was so loose it would have given even Jamie Oliver (with his pinch of this, dash of that) cause for alarm. I googled and I read, then I got on with it. The batter was simple, the oil not too deep, the results delicious, although slightly rich for my taste. I had some extra flowers so, fired up with enthusiasm, I made some more, this time with a simpler filling (ricotta and herbs). For me, that was more like it. 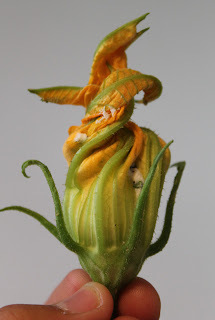 The result was sensational: the initial crunch gave way to the softness of the filling, the last bite being the sweet, crisp and juicy courgette sepals or flower base. These would be impressive served for a special lunch but why wait? I think it's worth making them for a summer supper. The simple batter I made was an amalgamation of two recipes. Some batters use an egg, some use beer or wine instead of cold water. Others don't use an egg, fearing that this makes the batter too heavy but balance is everything and you find your own preference. For the stuffing, it seems there are endless variations on this particular theme; I've found potato and greens, meat, cheeses and herby rice. If you have Mark Diacono's Veg Patch (River Cottage Handbook No. 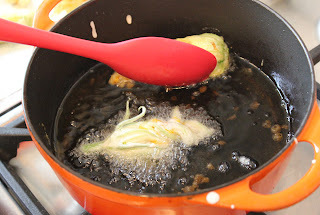 4) you'll find that he stuffs the flowers with the chopped and sautéed courgettes themselves! 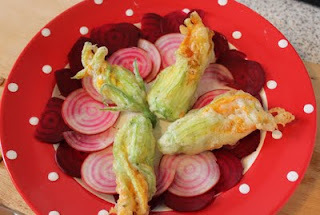 I'm quite taken with the idea of battered veg, and I've read of applying this way of cooking to the unstuffed flowers but why stop at courgettes? I haven't tried it (yet) but I think that the same principle could be applied to pea pods, mange tout, baby carrots and baby corn although courgette flowers visually steal the show. Fried flowers may not be to everyone's taste but don't let that stop you from making the most of your courgette flowers: I've found plenty of other ways of using courgette flowers on this Australian website. Put the flour in a bowl and gradually whisk in the liquid until it's the consistency of double cream. If too thin, add more flour; too thick, add liquid. It should nicely coat a dipped finger. Prepare your filling (Jamie Oliver suggests adding grated nutmeg, parmesan, chopped mint, lemon zest and chopped chillies to 200g of ricotta). 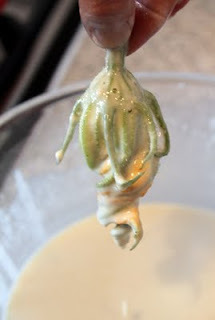 Gently prise open the flowers and, using a teaspoon or piping bag, fill the courgette and carefully twist the top of the flower to seal it. Repeat with all flowers. Pour oil into a pan up to a depth of about 8 cm. Heat the oil (sunflower is best) to around 180 C - if you don't have a sugar thermometer, drop a piece of potato or bread into the oil; when it turns golden, your oil is ready. Holding each stuffed flower by the stem (or bottom for female flowers), dip it into the batter and carefully transfer to the hot oil. (Don’t fry more than two flowers at a time or the oil temperature will drop.) Fry for about a minute (you’ll be able to see when it’s done as it will turn golden and crisp). You may need to turn it in the oil to cook both sides. Remove with a slotted spoon onto kitchen paper. (I used a silicon spoon which works just as well.) Serve as soon as possible, with lemon wedges and a lovely salad. Families, friends and neighbours were relocated as one from the Somers Town area behind Euston and were bonded by moving to this new life together. Most of the tenants today were either born here or have lived here for many years; elderly tenants have known some of today's mothers since they were babies; this not only adds to the sense of community (people know each other here) but provides a wealth of history if you have the time to chat, which I do. I enjoy knowing that this is such a safe, and largely peaceful, community that people have wanted to grow old here. So, the history. Well, I've finally been spurred into action by someone who used to live here, in fact was born here, and contacted me through this blog. She left in 1983, I moved here in 2002 but it's astonishing the number of people here that we both know (of). I've been entertained by email with stories from the past and she's been kind enough to provide me with a few photos from her personal archives. So the history page at the top of this blog is about York Rise beginnings and how that ties in with our veg growing today. I hope that other readers will enjoy it, even if it may be a bit long - and on Friday I'll be back with the veg news! 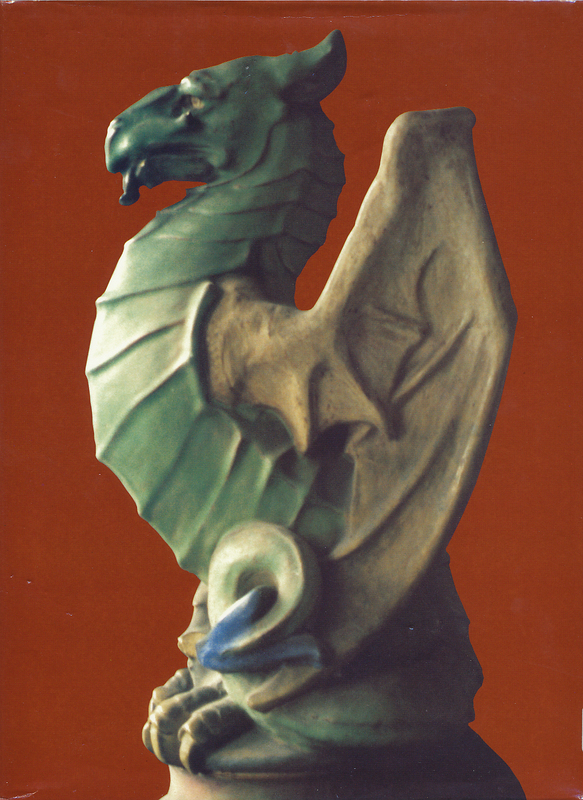 The Wonderful Wyvern, who used to sit in the centre.